Hi everyone, Steph Ackerman here to show you how to make a super cute Bowdabra dog bow. It’s as easy as 1-2-3 to make this adorable pet bow! Start by placing the bow wire in the Bowdabra, wrapping it underneath so it is out of your way. Leave a tail of ribbon approximately 4″ long and start making your bow. Continue making your bow until you have the number of desired loops. Add scraps of red ribbon, placing them in the channel. Add scraps of black and white ribbon in the channel. Use the Bow Wand to push the layers into the Bowdabra. Pull up on the bow wire and tie off. Fluff out the bow and cut the scraps to fit. Now that the bow was done, I needed Paulie to cooperate and model his new bow. Paulie loved the Bowdabra dog bow and allowed me to tie it to his collar. 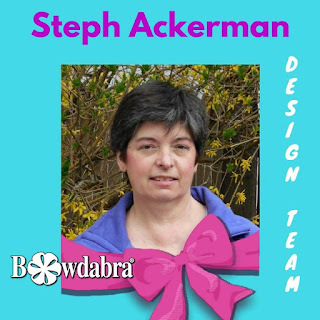 Visit Bowdabra blog each week as our team of creative designer’s show you more quick and easy DIY tutorials!